1B Umpire Dana DeMuth's out of the base path call in San Francisco during Sunday night's Cubs-Giants game led to a Joe Maddon argument and bafflement amongst broadcasting analysts Jessica Mendoza and Aaron Boone (we'll give Dan Shulman, as the play-by-play man, benefit of the doubt). As for Aaron Boone, yes, that would be the same "10% Boone" who scored just one-out-of-10 on ESPN's 2013 10-question baseball rules quiz. In what should come as a surprise to no one, the media cohort produced the lowest aggregate knowledgeability score of the three in-the-business groups tested (Managers/Coaches: 66%, Players: 55%, Media: 44%, Fans: 37%, [UEFL: 100%]). With none out and none on in the top of the 8th inning, Cubs batter Javier Baez bunted a fair ball to Giants first baseman Brandon Belt, who attempted to tag Baez as he ran down the first base line, prompting Baez to run to his left in an effort to avoid the tag before sliding into first base as DeMuth ruled Baez out for running outside of his base path. (Spoiler: The call was correct). As we reviewed nary one week ago, Official Baseball Rule 5.09(b)(1) governs this sort of play and clearly delineates the parameters under which a runner may be ruled out: "He runs more than three feet away from his base path to avoid being tagged unless his action is to avoid interference with a fielder fielding a batted ball. A runner’s base path is established when the tag attempt occurs and is a straight line from the runner to the base he is attempting to reach safely." (Obligatory reminder: It's a base PATH, not a base LINE). Photo 1: Baez at the time of the tag attempt. Replays indicate Belt's tag attempt occurred while Baez's left foot was in contact with the grass portion of the infield to the left of (inside of) the runner's lane and in fair territory and his right foot was in the air. Replays indicate that in attempting to avoid this tag, Baez ran across the runner's lane, so that his left foot came into contact with the dirt to the right of (outside of) the runner's lane and in foul territory with his right foot similarly positioned in the air. 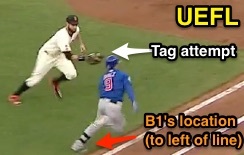 Hence, replays conclusively show that, at minimum, B1 Baez fully crossed over from his position fully inside the runner's lane to a position fully outside of the runner's lane during his attempt to avoid being tagged by F3 Belt. Photo 2: Baez at his farthest avoidance spot. This falls amongst the rarest of out-of-the-base-path calls wherein the actual painted lines on the playing field—namely, the runner's lane—provide a concrete visual reference point as to judge whether Baez ran more than three feet away from his base path to avoid the tag. Since the runner's lane is exactly three feet in width, and Baez fully traversed the lane so that he was completely inside (to the left of) it when the base path was established, and fully outside (to the right of) while completing his avoidance maneuver, we can conclusively decree that Baez ran more than three feet away from his base path to avoid being tagged and, thus, U1 DeMuth's out-of-base-path call was correct. One point of contention may be that while Baez's feet were decisively inside or outside of the three-foot line, his body remained over the lane. Rule 5.09(a)(11) Comment tells us why this claim is irrelevant in determining a runner's position: "The lines marking the three-foot lane are a part of that lane and a batter-runner is required to have both feet within the three-foot lane or on the lines marking the lane," while Wendelstedt prefers a center-of-gravity approach. If position is judged by the location of the runner's feet, and not by the body, because the feet were at one point fully inside and at another point fully outside of the lane, and not touching its lines, Baez did indeed run more than three feet away from his base path in an attempt to avoid being tagged. Had he dragged his skate along the blue line until the puck entered the zone, he would have been onside (sorry, hockey philosophy just mirrors baseball's in this situation). If center-of-mass is a consideration, we have a grass-to-outer-lane-line situation, which also appears to be >3ft. Final ironic thought: Had Baez stayed within his runner's lane from the get-go, and then attempted to avoid the tag by similarly running to his position as indicated by Photo #2, he likely would have been ruled safe for the missed tag, and not out for having run more than three feet away from his base path.